John 11:25, I am the resurrection, and the life. Jesus Lives for Me is a soft nylon flying disc is10" in diameter and can be used almost anywhere. Theme Bible verse is John 11:25, I am the resurrection, and the life. Disk measures 10" when open. Jesus Lives For Me! Flying Disc by CTA was published by CTA in February 2019 and is our 566th best seller. The ISBN for Jesus Lives For Me! Flying Disc is TDJLV19FD. Be the first to review Jesus Lives For Me! Flying Disc! Got a question? No problem! 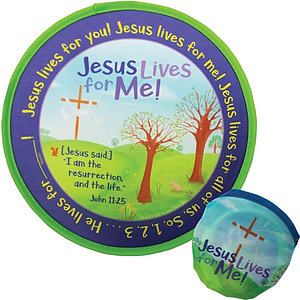 Just click here to ask us about Jesus Lives For Me! Flying Disc.